So what did I serve for my mother for our regular Sunday dinner at my place ? Well, this Sunday it was Massaman Chricken Curry according to the a recipe in the weekly magazine Femina (issue 4/2019). The changes I made was to use only 400 g chicken breast instead of 500 g kitchen breast, as I could get portions of 400 g kitchen breast in my local supermarket. I also decided to use plain olive oil and plain sugar instead of coconut oil and coconut sugar, as I did not have those ingredients in my kitchen. I cannot see, that to purchase such special ingredients, if you only have to use those for this one dish. The taste of the final dish is not high in curry strength, which suits my mother excellent, as she is not a fan of spicy food. So if you want more curry flavour, you have to increase the level of curry paste or try another type of curry paste. Heat up the oil and curry paste in a medium sized cooking pot. Fry the chicken pieces until, they are not raw anymore. Add in the chopped red onion and it fry for 1-2 minutes. Add in the chopped potatoes and sweet potato and let it fry for 2-3 minutes. Add in the coconut cream. Place the lid on the cooking pot, and let the dish simmer gently for 15 minutes, until the potatoes are boiled tender. Season the curry sauce with sugar and fish sauce prior to serving the dish. 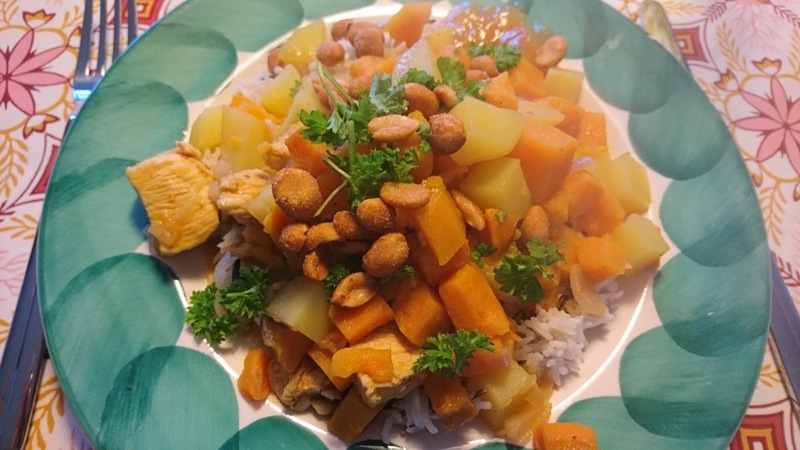 Serve the chicken dish with boiled rice and salted peanuts. February - what's up ?